(All photos: Bill Griffith/Boston.com). Click photo for larger version. Sometimes one finds the product of a blended family in the automotive world, and that's the case with today's test car, the 2010 Volkswagen Routan SEL Premium. [Scroll down to read the 2011 model's minor changes]. It's the progeny of a brief dalliance between the former owners of Chrysler (Daimler) and Volkswagen. They mated the estimable Chrysler minivan with the VW design department in order to give VW a "people-mover" for its lineup. The result: The Routan. Even the name suggests this unusual union. 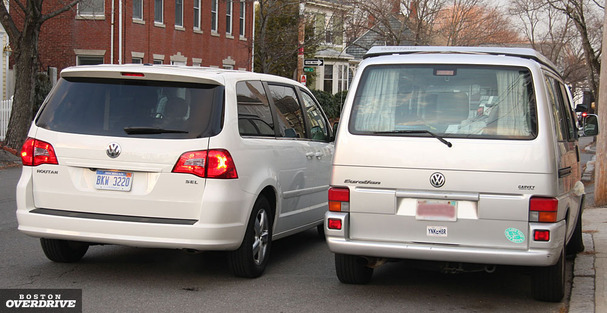 When VW announced the Routan at the 2008 Chicago Auto Show, it said the newly coined name linked VW and America, melding the English word "Route" and the "-an" suffix appended to VW's European vans, the Touran and Sharan. However, it doesn't connect the Routan with VW's venerable Vanagons and Eurovans. Also, any resemblance between the Routan and the original VW Microbus surely is wishful thinking. The test Routan was a top-of-the-line version with navigation, onboard entertainment system, and an MSRP of $39,300 (including destination). My street tends to have an eclectic assortment of vehicles parked by the curb on any given day, and I managed to pull alongside both a Eurovan and a newer Dodge Grand Caravan to take comparison photos. The short description of the Routan is that VW gave the Chrysler minivan a restyled nose (quite contemporary), a European-tuned suspension (well done), and upscale interior with seating for seven but minus the popular "Stow 'n Go" seating. While lacking that popular feature, the second-row captain's chairs are quite comfortable and will fold forward or recline, but not stow away or spin around for "inside" tailgating with folks in the third row (for 2011, Dodge has discontinued the latter "Swivel 'n Go" option). 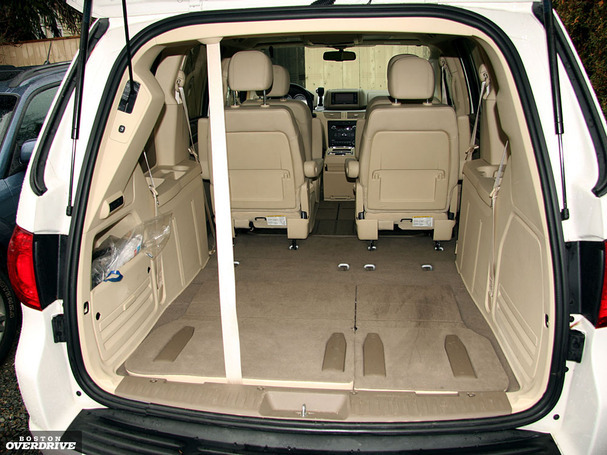 The third-row bench seat does fold flat to expand the cargo area, but even when it's upright, there's a deep well that is configured nicely for shopping bags or luggage. Buttons on the key fob control the sliding doors on either side of the Routan as well as the power liftgate. All these operations can also be controlled via the overhead console; in addition, the second-row passengers have an open/close button and there's a tailgate closing button on the back doorframe. The fob also has a remote start feature. We discovered that it works from a distance after inadvertently starting the Routan while opening the front door to our house with an armload of packages, one of which squeezed against the fob, activating the starter. We found the Routan happily running several minutes later when heading back out for more bundles. Most minivan drivers and passengers enjoy those vehicles' inherent high seating position. Mrs. G, however, felt the passenger's seat was both too high and lacking in legroom. The driver's side seat, on the other hand, had power adjustments and plenty of legroom. An annoyance was that the center armrests had to be raised to buckle the seatbelts. 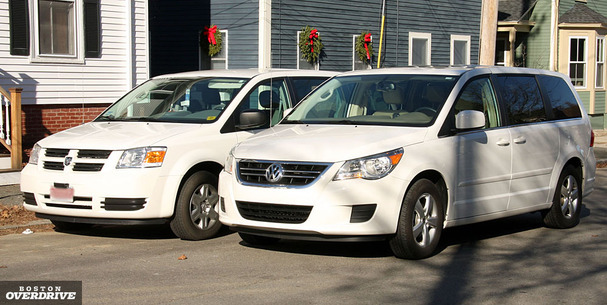 The leather seats were comfortable, heated, and gave the minivan a near-luxury feel. VW's adjustments to the suspension added to that perception. The Routan was stable and predictable on the highway and handled our latest stretch of bad-road test track with aplomb. There was a nice combination of stiffness, spring damping, and sound absorption to make the ride feel decidedly high quality. The Routan had well-chosen soft-touch dashboard materials with a useful tray in the top center. Instruments were VW-designed with white background (black markings and red needles) and white digital readouts for additional onboard computer information. It was attractive in most situations except when hit by direct sunlight which washed out the digital display and showed just the electronic circuits underneath. The three-zone (left-right-rear) automatic climate control was located low on the center stack and easy to read and use. Above that, however, was a standard-issue Chrysler navigation and audio screen. If you own it, you get used to it, but it's tedious for the casual user. The rearview display was needed because rear visibility through the rear quarter windows was blocked by rear headrests. We averaged a meager 16.9 miles per gallon on a first stretch of mostly city driving but the van seemed to use less gas on a later unmetered highway run. The 4.0-liter V-6 produced an adequate 253 horsepower and 262 lb.-ft. of torque, sending the power to the front wheels via a six-speed automatic transmission. We always felt there was plenty of acceleration available, but the Routan would downshift routinely on big highway climbs, perhaps the result of the vehicle's 4,621 pounds or perhaps in need of recalibrating the shift points. VW has taken a decidedly low-key marketing approach with this stepchild, which won't help sales with the new Honda Odyssey, Toyota Sienna, Kia Sedona, Mazda 5 and Nissan Quest minivans fighting for a segment that the manufacturers are hoping to revitalize. Being a single 25-year-old man automatically makes me a poor minivan tester. But when I rented a Grand Caravan with some friends in Arizona a few months ago, I practically saluted it after a 1,000-mile road trip. While minivans look like toasters, there's no other body style that can haul five adults and their gear in total comfort. In Boston, I was mostly alone driving this 2011 Routan SE, a mid-level trim with vinyl "leatherette," navigation, and rear-seat entertainment. Following the updated 2011 Dodge Grand Caravan, the 2011 Routan shares Chrysler's all-new 3.6-liter V-6, good for 283 horsepower. A new 6-speed automatic replaces the 5-speed, and during my drive it was quick to kick down and devoid of abrupt shift changes. The steering wheel receives an upgrade, with a thicker, softer leather-covered rim and buttons for the cruise control and trip computer. On the underside at the "9" and "3" positions are cleverly hidden radio controls. The best part of the Routan is the steering — nicely-weighted, responsive, and connected to the road. As Bill notes, the suspension is truly surprising in its deftness. Most minivans, even the 2011 Honda Odyssey I'm driving now, are languid and write off sporty handling entirely. But beyond the attractive styling and real aluminum trim on the doors, there's little to convince us the Routan is a Volkswagen. The brand confusion can be seen at night, where switchgear illuminates in VW's bright red and the instrument cluster stays a Chrysler light blue. Unless you find a good deal, there's little reason to prefer a Routan over the 2011 Grand Caravan or Chrysler Town & Country, which I found quite fun to drive on curvy, back roads. The Routan isn't a bad choice, it's just lacking the competition's higher-quality interiors and flexibility (the Odyssey's cooled drink bin and flip-up trash container, or the new Caravan's sliding center drawer and those trick second-row seats). While the Routan's driving dynamics impress, for the money it's not the best choice in this segment.